I've been wanting to make homemade pinwheels with the kids. So, I looked up instructions online. I found some instructions "HERE". <==These instructions use a push-pin and a pencil with an eraser. It actually worked pretty well. There are also instructions out there that suggest using a straw and a brass fastener (brads, or so my husband says). I could not find the fasteners at any drugstores and never made it to an office supply store. So, I took some of the fasteners off a folder I had. The fastener/straw combination definitely doesn't work as well as the pushpin/pencil combo. When I was in a CVS, I was looking at some pinwheels and it looked to me like a flexible straw would work if I could find something to attach to the front. So, I ended up hot-gluing a button to the front of mine and a little craft spool to the back. These don't blow as well, but I was planning on using them for decoration only. Truthfully, the ones that blew the best were the ones with the pushpin/pencil. I don't suggest them for a child that would pull it apart or for children under 3. 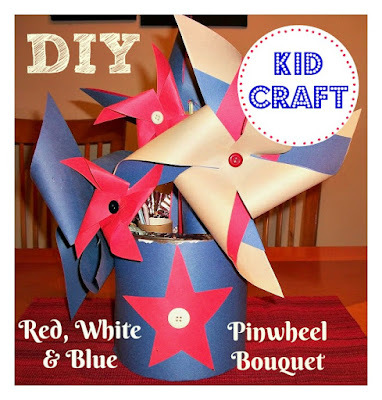 Here are the pictures of the Memorial Day Pinwheel Centerpiece from a couple different angles and with different combinations of pinwheels. Truthfully, I couldn't get anything that I absolutely loved, but I figured someone else might be able to take the idea and run with it! I think it might be cute with some silver curlies peeking out between pinwheels. 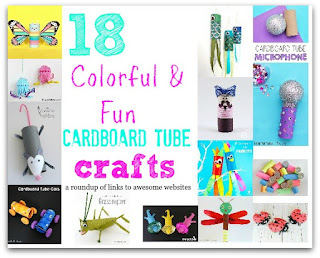 LOOKING For MORE Kid CRAFTS? Check out these TOILET PAPER TUBE CRAFTS!